We are all constantly learning new skills and adding to our levels of knowledge. There are a number of different process driven models that try and explain the process of not knowing a skill or theory to becoming what would be considered proficient. As a personal trainer we are essentially involved with the education of people in terms of exercise and health. The ability to understand the learning process and how we can move a client through the various different stages can greatly help us become more effective and proficient trainers. 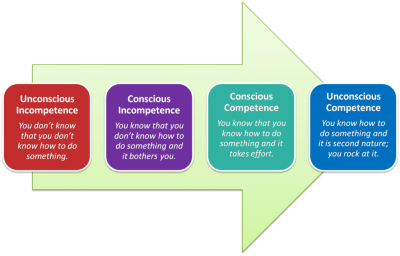 One of the key models of learning is called the four stages of competence model and was pioneered by Burch in the 1970’s. This model attempts to identify the key stages that we all go through on our way to competence in our chosen area. When we first attempt to develop a skill we are in a stage where we do not know what to do. Essentially we are totally ignorant of the skills that we will need to develop and in many cases the process that will accompany the development of these skills. This is normally treated as the start of our journey towards competency in our chosen discipline. To move from this stage to the second one you need some form of basic or initial training. This can be as basic as somebody giving you an outline of what you will need to do to become competent or reading a beginners guide. This is the second stage and involves the ability to consciously identify the fact that you have not yet acquired a skill and the elements of a skill or theory that you do not understand. This also says something about your ability to also comprehend what you do understand. Once you can identify what you do and do not know this essentially gives you a to-do list or more of a to-work on list. This is then basically your path to competence. This stage can be shortened if a coach is used, the reason for this is that at this point you are not always accurate in identifying what you do and do not know. This means that a coach can give you valuable feedback that will help keep you on track and make the learning process more efficient. But essentially this stage can be summed up in one word… practice. Like most skills things start to fall into place with repetition. This third stage is where you have gained the ability to perform the skill you have been learning. This is an interesting stage as although you have gained the ability to perform the skill the performance still requires some level of conscious thought. If you get distracted the odds are that the ability to perform may be lost. This stage is normally where confidence levels start to build as the learner starts to see a good level of progress. The need for a coach is reduced at this stage, however the need for practice is still vitally important. The more you repeat the task the more likely this is to be committed to long term memory and become a more stable and fixed skill. This is where you have reached what is often termed mastery. A skill can be performed without any conscious thought, it has become second nature. It is this stage that people would be referred to as experts, to the outsider the skill now starts to look easy. Even when this stage has been achieved it is very important to maintain levels of practice. Skills can be lost over time if not used. As they say use it or lose it! As a personal trainer or any kind of educator it is important that you understanding these stages. By you having a better grasp of these stages you can make sure that you give your clients all the support that they need in order to progress with their skill acquisition.